Now that did elicit a giggle! The Greeks have managed to prove the rumors that they are pig headed are true. I'm sure Raffone knows all about this. A final count showed 229 MPs out of 300 voted in favour of the measures, with 64 voting against and six abstaining. Amazing how they all purr like kittens when offered a fist full of Euros, 86 billion of them. The reality is Greece doesn't pay a cent back, instead we get a permanent train of Euro's plunging down the Greek black hole. Yep. It would seem Greeks, like everyone else; bows to the might of money. What a sad, sad, sad world. Draghi just now: ECB exposure to Greek debt is €130 billion. In other words, out of the ~300ish outstanding, the European Central Bank has roughly half of it and is thus exposed to a 100% loss on the entire sum should Greece walk off. How did they wind up with that exposure? That's simple: Post the first two bailouts they "bought" it from the commercial banks that formerly had it, transferring the risk from private concerns that had taken it on with the intent to make a profit to the entirety of the EU citizenry. I remind you that the ECB has single-digit billions in capital; their leverage on this debt alone is well over 10:1 without any exposure to anything else. Given that everyone says that Greece cannot pay the ECB is factually bankrupt right here, right now. And this is why the market is up wildly on this now-admitted, in-your-face, fact. Yes, well the most recently published balance statement of the Greek Central Bank showed a couple of liabilities to the ECB. The smaller one is the "normal" facility deposit of the ECB. This one started the year at 10 billion and rose to 17 billion a few months later. The larger one is the "abnormal" facility deposit of the ECB. This one started the year at 75 billion and rose to 100 billion a few months later. 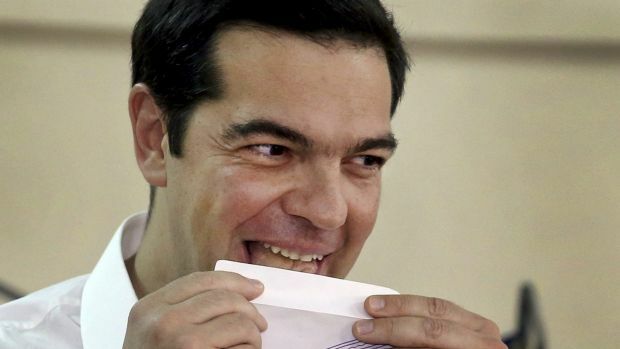 So in the course of the first few months the ECB injected 32 billion into the Greek central bank. Much of it was to replace the savings the Greek depositors pulled from the banks. So basically Greeks hardly have a cent in their own banks, only wages that have been going in and such like. So from the looks of things the total loan assets of the Greek banks was down 130 billion. Early this year liability was to 30 billion of Greek retail deposits and 100 billion of Euro funds to replace Greek deposits that had already walked. Now there is zip. Greece is simply a chronic kleptocracy. It will spin any story, do any dance to get more money from the Euro's. Pull the plug on it and set it adrift. Find all the Greek stamped Euro's and trade them for Drachma. Make sure those are German stamped Euro's you got under your bed. #1 is not a Club Med member ... or even European! That was a fine example of 'haste makes waste'! I'll copy&paste to the right thread. Interesting animation on the millions entering Western Europe. This will fuel the civil war that Marty predicts. Before the refugee crysis his 2020 revolution didnt make sence, now absolutely! And after that we are growing so old, forget it, Europe is a nice place to visit and then leave again. Beginning of the next phase? What’s the problem with Italian banks? Italy just bailed out its banks again and they can do that because they get ECB money and cheap bond money with cheap interest rates. Im not planning to be around by then, cause THAT will be ultimately ugly. The right wing is already smelling blood and growing in some countrys to the majority with over 50% of votes, soon to spread to all countries, bringing back dictators and authoritarianism, class war, foreigneir hate, freezed up banking systems and so on. The EU put out a new law, now they can freeze all of europes banks for 30 days.....yes you heard that right!